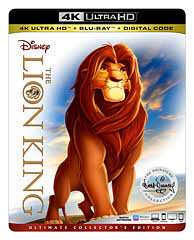 “The Lion King”, Disney’s magnificent coming-of-age masterpiece, will be the first ever Signature Edition to roar onto dazzling 4K Ultra HD. Celebrate the full glory of Disney’s magnificent coming-of-age masterpiece, “The Lion King.” With humor and heart, breathtaking animation, and award-winning music, this much-beloved story transports families to the Pride Lands and inspires generations of fans. The Walt Disney Signature Collection includes groundbreaking films created or inspired by the imagination and legacy of Walt Disney, featuring timeless stories and characters that have touched generations. Each release will offer special features for every member of your family.